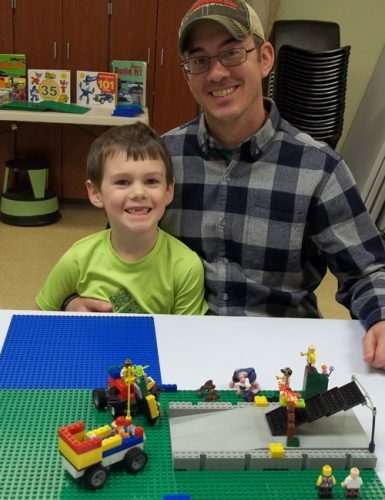 Pictured, from left, Warren Spencer and his dad Brian show off their Lego creation at Lego Club held at 1 p.m. the second Saturday each month at North Webster Community Public Library. NORTH WEBSTER — Computers are such an integral part of our lives today it’s hard to imagine functioning without them, but they can also be hard for the average person to understand. What is that pop-up dialogue box asking? Do I click on OK or not? What happens if I click on the wrong thing? Get answers to your questions at North Webster Community Public Library’s Geek Speak Computer Consulting Series that starts 1 p.m. Thursday, April 18, and will continue the third Thursday each month through July 18. With over 20 years of computer consulting experience, Ian Crighton, owner of Crighton Technical Services, will share his computer expertise as he discusses a variety of computer topics and issues in language the average person can understand. The April 18 class will focus on computer security. Other class topics will include computer back-up solutions on May 16, hardware basics from laptops to networks on June 20 and conclude July 18 with mobile computing – phones and tablets. The classes are free and open to the public. Remember when games were played on a game board instead of online? Spend the afternoon at the library playing board games with real people at 1 p.m. Tuesday, April 16. Bring friends or come solo and enjoy some retro-style gaming. Writer’s Corner meets at 10 a.m. Monday, April 15, when members will share their compositions about their favorite president. An informal time of adult coloring is planned for 1 p.m. Wednesday, April 17, followed the next day by the dancing fitness class “Let’s Move” at 6 p.m. Thursday, April 18. In the youth department, Lapsit Story Time for babies and toddlers continues at 11 a.m. every Tuesday and Friday, along with crafts and stories at 4 p.m. every Tuesday for grades K-5. Lego Club will be held at 1 p.m. Saturday, April 13, for kids ages 5 to 12. Keep informed of upcoming library programs and events and join the library Text Club to receive notifications on your cell phone. Text the word LIBRARY to the number 36000, then follow the prompts. To receive email notifications, send your e-mail address to [email protected].